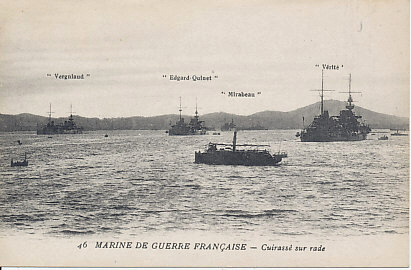 Battleships of the French War Navy in harbor including the Vergniaud, Edgard-Quinet, Mirabeau (in the distance), and Vérité. Vergniaud and Mirabeau were 'semi-dreadnoughts' (Cuirassés d'Escadre) of the Danton class. Edgard-Quinet was a Croiseurs Cuirassés, an armoured cruiser. Vérité was a Cuirassé de deuxieme rang - a battleship of the second rank. Although England had no explicit commitment to aid France militarily in the event of a European war, British and French military staffs coordinated plans. These included provisions for Britain's defense of France's Atlantic ports while the French fleet redeployed to the Mediterranean Sea. French ports in the Mediterranean included Marseilles and Toulon on the French mainland, and Oran, Algiers, and Phillipville in Algeria. French ports on the English Channel included Dunkirk and Calais. In 1914, the navy had seven 1910 and 1912 dreadnoughts (Cuirassés de premiere rang) capable of 20 knots and ten "semi-dreadnoughts" capable of 19 knots. Older battleships (Cuirassés de deuxieme rang) dated to the years 1891 to 1903. France lost four of these battleships of the second rank during the war, three of them to German submarines. Three armored cruisers (Croiseurs Cuirassés) dated to 1905 and had a maximum speed of 23 knots. An additional nineteen cruisers dated as far back as 1893. Five were lost during the war, four to German and Austrian submarines, the fifth to a mine. The Navy had 84 destroyers, three of them completed in 1914. Thirteen were lost during the war, four of them in collisions. The Navy included submarines, many of them constructed during the war. France lost fourteen submarines in the war, most in the Mediterranean, the Dardanelles, or the Sea of Marmora, and many to Austro-Hungarian submarines, ships, seaplanes, or shore batteries. Most of the French Navy's ships were coal-powered. Before the war, the navy, including reservists, had about 65,000 personnel.